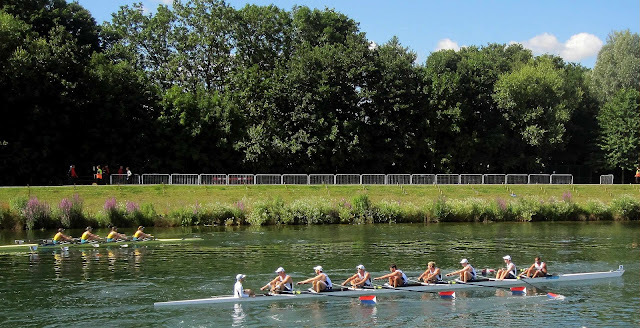 Following the Games in London, two-time Olympian David Banks of the 2012 U.S. men's eight was kind enough to share his thoughts on this year's team, the racing in Lucerne and Eton, and just what it means to compete at the Olympics. Having begun his rowing career at Stanford, Banks has been involved with the U.S. national team since 2008, where he has consistently been lauded by his peers as the ideal teammate–positive, hard-working, and without complaint–and possesses one of the best power-to-weight ratios on the squad. For now, Banks is reflecting on London, but hasn't ruled out Rio. RR: From the outside, everything I've heard about the athletes in the men's eight is that it was an outstanding group, really supportive of one another–blue-collar, hard workers. How were the team dynamics? David Banks: This group was an amazing group to be apart of and to work with. All nine guys in the boat but also everyone in the whole selection group and the alternates. It was a lot of fun and an amazing experience to work with these guys this whole year. It was a very long year for all of us and everyone in selection and I think that definitely helped to forge a strong group cohesion. Everyone just wanted to work and get faster the whole year and we pushed each other pretty hard. It truly felt like a team and everyone had a role to play–everyone was focused on doing their job and contributing to making the boat go. DB: There definitely was some pressure sitting on the start line in Lucerne. Everyone knew what the stakes were at that point. But I think the boat responded very well to the pressure and to the challenge. I think we were able to, as a group, turn it from this huge weight on our shoulders to this opportunity before us. So at the start line I don't think we were held back by anything and were able to be free to take on the challenge. I think we were well prepared throughout this year for this challenge and the pressure and stress was nothing new to us. RR: How did you feel on the start line in London, before the heat? How different was it from your experience of Lucerne? DB: It was a really tension-free feel to the start of the Heat. We all had worked so hard all year and had to go through many obstacles to get to that point, to that moment. It just felt like we were ready. We had done the work and we were ready to just go. Its the Olympics so it can be hard to really reproduce how you feel on the start line, but it we felt good having already been in a pressure environment in Lucerne and that gave us some confidence. Lucerne was a little bit different, everything is smaller than the Olympics. There are definitely more distractions in the Olympics but again, we felt well prepared. RR: What do you remember from the final? DB: It was tough. Everything happens so fast and its hard to remember exactly how things happened. Just remember that everything was really close in the race. The whole field, 1-6 were so close the entire way down. We knew we were in fourth coming into the last parts of the race and that we had work to do to get back into the leaders. We were pushing, everyone was pushing and couldn't hear anything the last 300 meters, the noise from the crowd was incredible. Unfortunately, we came up just a little bit too short. It was a very tough race and tough way to end. It was one of the closest eights finals in history and in those situations you want to come out on top. We just came in on the wrong side of it. RR: What does this experience mean to you? Will you continue to train for Rio? DB: It will still take some time to really get more perspective on the experience and everything. But It is a great honor to represent your country, your family, and everyone who has helped and supported you and to represent those who don't have the same opportunities that you do. In my family and in my family history there are so many family members who have not had the same opportunities that I have had for many reasons, whether it be race, or gender or religion or whatever it may be. They paved the way so that I could be at that start line in the Olympic final. I will never forget that and am very fortunate for the opportunities that I have had and that has always helped put things in perspective. Right now, I am not sure about the future or Rio in 2016. Just going to get back home and take some time to figure out my next steps. Thanks very much to David for taking the time, and we wish him the all the best for the future, whatever it holds (though we do hope that it includes a third appearance at the Olympics with USRowing)! For more on David, see his profile page on the official site of USRowing.